Chimney Rock and the Rocky Broad River as seen from the Hickory Nut Gorge Brewery. Beer Lovers … you’ll be in heaven with the selection of breweries in and within a short drive of Lake Lure, North Carolina! The Asheville area is the beer capital of America! Per capita, Western North Carolina has more breweries than anywhere else in the country. Within 30 miles and a 45 minute drive of Lake Lure, NC, there are over a dozen micro-breweries and more are springing up all the time. Most – if not all – Asheville breweries and other area favorites have tasting rooms, give tours of the brewery and some even have stage set-ups for live entertainment. You could literally spend a week touring breweries. 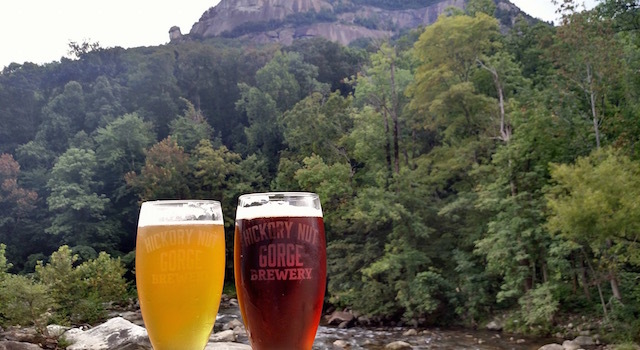 Hickory Nut Gorge Brewery -We first need to start off with our local favorite – Hickory Nut Gorge Brewery is our local nano brewery nestled on the shores of the beautiful Rocky Broad River in Chimney Rock Village. 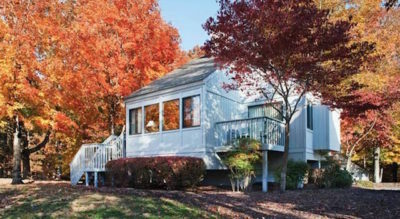 It boasts big views of Chimney Rock, amazing outdoor deck space and good beer! It’s also kid-friendly and dog-friendly (within the outdoor spaces) and you can even dip your toes in the water along the sandy banks of the river. Life doesn’t get much better than that! 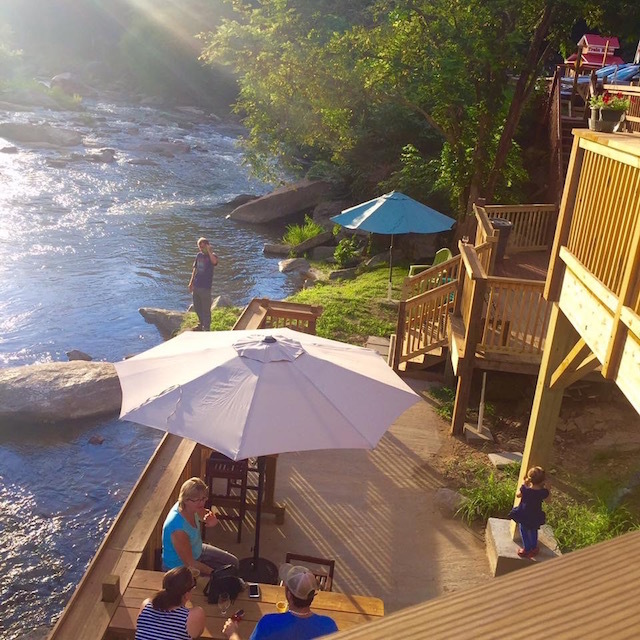 Great decks and riverside seating options at Hickory Nut Gorge Brewery. Below is a locator map and location lists of all the current Asheville breweries, Black Mountain breweries and Hendersonville breweries — 14 in total. These include micro-breweries, nano-breweries (smaller than micro) and brew-pubs located within 30 miles and/or a 45 minute drive of Lake Lure, NC. Click on any one of the numbered markers for Brewery Name and Address. Below the map is a numbered list of the corresponding locations. Follow their links to find out taproom hours, tour times and dates for live entertainment. Please note, some taprooms only accept cash so come prepared with cash so you can have fun and, of course, drink responsibly. 1. Asheville Brewing Company – 77 Coxe Avenue, Asheville, NC 28801 – (828) 255-4077 – Check out our post for more details on Asheville Brewing Company. 13. Pisgah Brewing Company‎ – 150 Eastside Drive, Black Mountain, NC 28711 – (828) 669-0190 – Check out our post for more details on Pisgah Brewing Company (a personal favorite). Other NEW favorites … not even on the map yet – they’re opening up so fast! Sanctuary Brewing – 147 1st Ave E, Hendersonville, NC 28792 – (828) 595-9956 – Sanctuary is a craft brewery in Hendersonville, NC. They combine amazing beer with strong animal advocacy. Dogs are welcome and they’ve got great home-brewed beers and there’s always something else fun going on inside! Definitely check them out. Triskelion Brewing Company – 340 7th Ave E, Hendersonville, NC 28792 – (828) 388-7051 – Located in Hendersonville’s Historic 7th Avenue district, space is new and fresh with a comfortable vibe. Great beer, music and they even have a separate party area. Dry Falls Brewing Co. – 425 Kanuga Rd, Hendersonville, NC 28739 – (828) 696-0660 – Dry Falls Brewing Co. is located in an old brick paint and body shop building that has been restored. They are pet-friendly and the family has three basset hounds themselves. The building includes a large bar area, a small bar seating space, and several high-top tables. there are great big roll up garage doors, perfect on warm, sunny days. Two big boys come to town – Sierra Nevada and New Belgium. Sierra Nevada Opened Spring 2014. The facility is located in Mill River not far from the Asheville airport and will sit on 190 acres. Being that Sierra Nevada is an extremely environmentally friendly company, most of the land will be kept in its natural state; but, the company does plan to build a trail system with access to the French Broad River. The Brewery has a taproom, restaurant, gift shop and an outside area for live entertainment. It’s amazing!!! New Belgium will be next to open its’ doors with a scheduled opening date of May 2, 2016 for their “Liquid Center” Tasting Room. Starting in May, beer fans can kick back along the French Broad River in Asheville and sip a Fat Tire in New Belgium’s sparkling new “Liquid Center” tasting room. On May 2 the doors swing open at 21 Craven Street, Asheville, North Carolina, and beer fans can taste locally brewed New Belgium beers for the first time at the brewery’s new location. Tasting room hours will be Monday through Saturday, 11 a.m. to 8 p.m., and Sunday from noon to 8 p.m. Public brewery tours start this summer. 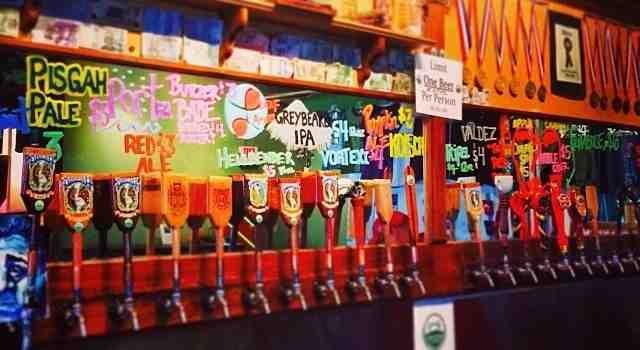 Enjoy exploring all the wonderful area breweries in Chimney Rock, Hendersonville, Black Mountain and Asheville. There’s a lot to choose from in close proximity to Lake Lure. We’ve enjoyed many and we hope you do too. We hope this list helps you quench your thirst as you discover all the amazing local craft beers available in the area. Please remember to drink responsibly and have a designated driver.